Possibly the Most Cost-Effective Way to Build a Church. Be Known for Something : Discover Your Church Communication Thread / Communication Strategy / Possibly the Most Cost-Effective Way to Build a Church. This past week I had the privilege of art directing a photo shoot at an incredible church in the Dallas area called IBOC (Inspiring Body of Christ). It was awe-inspiring to say the least. For the last couple of years, we’ve seen architectural plans and renderings of this dream building, and now to stand in the shadows of this enormous building was humbling. God is doing a great work in the hearts of the members as they see their building take shape. But God is also doing a wonderful work through the process that’s used to create the building. The Barron Group (out of Fort Worth, TX) started with a Charette process, moved to the architectural design and now the construction is nearing completion. This integrated process is called Design Build. To view this process from afar, it seems perfect. Pastor Rickie Rush and his members are so excited to see the building take shape and they anxiously await their first service in the new building. They’ll stream into the entrances and will instantly be taken-aback by the huge aquarium that you either walk by or THROUGH in order to get into the 4200 seat auditorium. Once in their seats, they’ll feel surrounded by God’s Spirit as 3 gigantic screens and a state-of-the-art audio-video-lighting system ignites emotion and excitement. All this for the purpose of winning the lost to Christ. But when you think about the entire process, it’s baffling to think that a $34 Million building can be produced. There are so many complexities that need to be supervised. The entrance for the scuba divers to enter the aquariums (to feed the fish and clean the tanks). The cabling infrastructure to organize the miles of wires that circulate throughout the hidden areas of the church. The recesses in the walls where the members can bring the “things” that they’ve left behind to follow Jesus. The area for the multitude of ushers and volunteers to go and assemble and relax. The many extra woman’s bathrooms to accommodate a usual bottleneck. The runway area around the ENTIRE worship center for the Pastor to “roam” and teach. …on and on I could go. 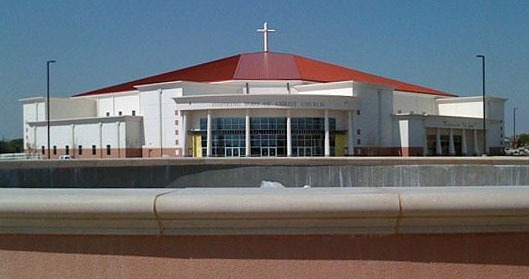 The cost-effective manner that this building was done honors God and Stewardship. It’s also less stressful and allows for engaging the church into the process. It’s called Design Build. I highly endorse it! Barron is one of the lead companies in the National Association of Church Design Builders (NACDB) and utilizes this integrated procedure seamlessly to assist the church. Charette: a unique design brainstorming process that hears the desires of the Pastoral Team and members. Architectural Design: the people who actually brainstorm with you design to your budget because they have direct access to the estimation teams on the “construction” side. This solves so many issues! Engineering: their engineer teams work together as a support for the overall design and build. They know the entire project and work as a team to make sure the master plan can be fulfilled with municipality codes. Guaranteed Maximum Price: this is so crucial! Because everyone is working together, no one points fingers at another process to blame them for an “unknown.” Now that’s refreshing! All design builders don’t work EXACTLY the same way, but the process is available in your area too. Just contact the NACDB and they can point you to the closest builder in your area that specializes in this process AND loves the church. While you’re there, you can find other companies (like us!) who love the House of Worship building process AND God’s people! Cheers for this content, guys, retain up the fantastic work…. Appreciation pro the suggestions and references information’s….